You may download and use them in any fashion free of copyright. You may feel free to sing and include The Baptism Song on any song platform, church or organization you wish - absolutely free without any copyright restriction - except, we do not allow you to print or publish The Baptism Song Book for sale. The Baptism Song was written to be changed and adjusted as many ways as you wish. Daddy makes up his own verses when he sings to us at night. He even made up a whole extra song that he wrote as an extension to The Baptism Song. We will try to sing it and put it up on our site soon. It is really fun and makes me go to sleep every night. The Baptism Song music is free to download by anyone with no fee. We have included a free high quality MP3 of The Baptism Song with piano accompaniment (Composed by world famous music composer and musician - Maestro Carl England of Portland, Oregon). It can also be used to sing The Baby Dedication Song and sounds beautiful. This downloadable composition is played at 104 Beats Per Minutes (BPM). This is the metronome Android APP that we used with Carl. Play it on your Android tablet or phone at 104 BPM and you will be singing The Baptism Song at the same speed as Carl England's musical accompaniment. You can go HERE to find a good metronome for iPad. Believe me, the metronome at 104 BPM makes ALL the difference. Singing it along with mommy is great also. 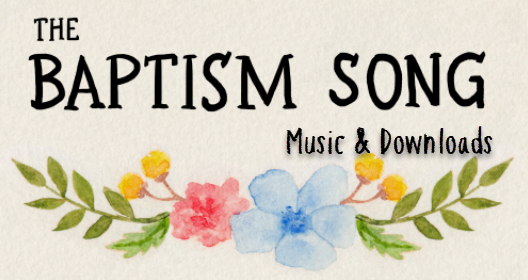 Due to numerous requests, we have also included Baptism Song Practice track so that you can sing along with my mommy at the proper speed of how the piano track plays. (104 BPM) Practice with mommy, like I did, and you will be able to sing it properly by using the MP3 at the ceremony. Here is the link to The Baby Dedication Song with mommy. It uses the same piano accompaniment at 104 BPM. So many people from around the world have told us how much they love The Baptism Song and Baby Dedication Song. Their number one request is that both songs be translated into their language. They also ask for books in their language. We are requesting the Internet to help out. Are you proficient in a language other than English? Would you like to volunteer to translate both of our songs into your world language? Go to LyricsTranslate.com HERE to see our requirements. We already have a wonderful Spanish version by Papi Torres. Thanks.